From the mountains of Utah, and the legendary Gib Yardley comes Man O’ War, he’s the kind to build a legend around. He has perfect conformation and phenotype. 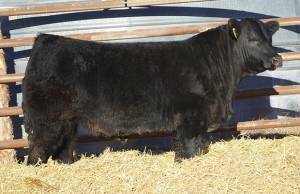 His sire was the leadoff bull in Denver, his mother is the definition of the kind of female you want as a cookie cutter mold. His great-great-great granddam is the dam of Yardley Whirl of a Dream, this is cow family GENERATIONS DEEP WITH QUALITY!